Springtime Breather Powder for Horses | Natural Supplement Helps Improve Chronic Breathing Problems for Horses | Springtime Inc. Helps support capillary wall strength, which can aid normal circulation, swelling, and oxygenation. The active ingredient in Breather Powder is tienchi, a somewhat rare botanical that has been used for hundreds of years. Historically, it has been used for a number of health benefits, but is best known for supporting the circulatory and respiratory systems. Recommended for supporting cardiovascular function, oxygen utilization, and respiratory health. Daily Maintenance: Give 1 scoop (2,381 mg of Tienchi) or 2 scoops per 1,000 lb. body weight. Dose may vary from horse to horse. Pre-Event: Administer two heaping scoops the evening before and the morning of the event. Cautions: Safe use in pregnant animals or animals intended for breeding has not been proven. If animal's condition worsens or does not improve, stop product administration and consult your veterinarian. Administer during or after the animal has eaten to reduce incidence of gastro-intestinal upset. Use with caution with cardiac glycosides and MAO inhibitors. Should be used with caution in those animal with hypertension. May be hypoglycemic. Kelley & Sargeant clearing their jump with ease. I am writing to tell you how pleased I am with both your DMG 5,600 and your Breather Powder. 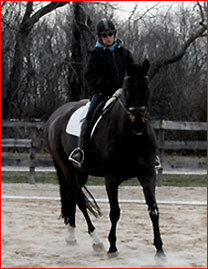 My 14 year old gelding, Sargeant, has severe allergies and was diagnosed with breathing issues a couple of years ago. I started him on DMG 5,600 on the recommendation of a friend, and it did wonders for him. We were finally able to compete in all the local hunter paces and were in the ribbons every time. I started him on Breather Powder last fall when his seasonal allergies kicked in and he was much more comfortable on our long rides. I made the mistake of taking him off both supplements a couple of months ago, figuring that his breathing would be better in the cold winter air, and, guess what, within a month he was in distress and diagnosed with breathing issues brought on by the allergies. He is back on both the DMG 5,600 and Breather Powder, his breathing has improved, and we're gearing up for the spring season. I learned my lesson and Sargeant will be on both supplements from here on out! Thank you for your great products. Saniba and Lynn enjoying a brisk winter day. My 11 year old Hanoverian mare, Saniba, (my new horse) gets seasonal allergies starting in October that run throughout the winter months. I have tried every product imaginable. I recently received a 10 oz Breather Powder from Springtime and started putting it in her food, and the results were immediate. 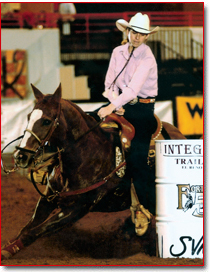 In only two days, she was able to return to normal respiratory function. I plan on keeping her on this for the duration of the upcoming winter months. P.S. My older Lab is doing great on Joint Health Chewables. Kaci and Dallas in the ring. "…she has not bled again." I have been a loyal customer for the past three years after discovering Breather Powder. I thoroughly believe it has done nothing but help my now 22 year old barrel racing mare named "The Right Signal" aka Dallas. After competing one night several years ago, I noticed that there was a small trickle of blood from one side of her nostril. She had been making good runs, but was not firing the way she normally did. So after discussing the options, we decided to put her on Breather Powder, which was recommended to us by someone else who had success with it. We chose Breather Powder because of it being an all natural herbal product. I am happy to say that in three years of competing consistently, she has maintain healthy respiratory function. I would recommend this product to anyone that was in a similar situation. I just wanted to share my story. Thank you for your time and a great product. 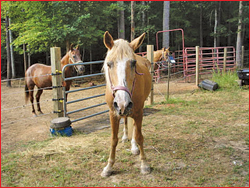 "...more energetic, breathes very well..."
I have been using Breather Powder on my 23 year old Tennessee Walker for over a year now with fantastic results for his heaves. Two weeks after I started using this product, Chance was able to breathe so much better than he had in years. I spent thousands of dollars on medications that would work for a couple weeks but as soon as the heat hit they stopped working. Breather Powder has made it easier for Chance to breathe even in 100+ degree weather. I am grateful to you for making such an inexpensive product that really works for horses with heaves. I thank you and Chance thanks you. Here are a couple pictures of Chance. I also have him on Spirulina Wafers which I crush and add to his feed. He developed a chronic nasal discharge, and was put on antibiotic after antibiotic. But, as soon as he stopped them, the discharge would come back. After reading some of the letters from horse owners that use this product I decided to add Spirulina Wafers crushed in Chance's feed. The nasal discharge started to become less and less. He still has a slight nasal discharge but not at all like he did. Since putting him on the combination of Breather Powder and Spirulina Wafers he has become more energetic, breathes very well and is starting to gain his weight back. I also use Spirulina Wafers for one of my old dogs that has breathing difficulties and they have helped her tremendously. Your products are great. Thank you for making such wonderful products and giving me my favorite horse back.